It is important that you submit your Gaelic4Mothers&Others site details with the Association before you start. It is important that you also ensure all your participants are registered Gaelic4Mothers&Others members of the Association before they can participate in blitzes. This is completed through the normal registration process with your club registrar. Below is also a sample participant registration form that you may use on site for your club to gather individual player details. 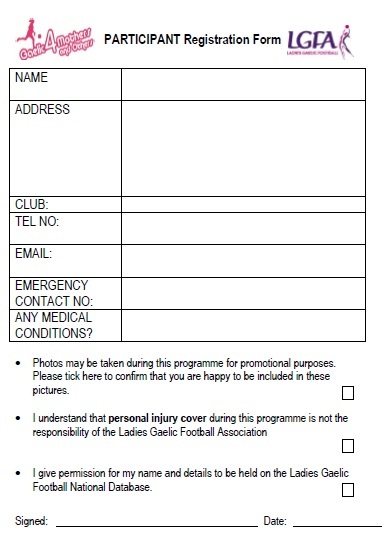 Please note this is not the official registration form to register players with LGFA. Does a Registration fee apply for the first six weeks of the programme? When should players commence thinking about registering with the LGFA? After 6 weeks, it is the clubs decision to continue running the initiative. All players must register as official members of the Ladies Gaelic Football Association through their club registrar if they wish to continue participating. Please note, G4M&O participants cannot pay into the injury fund. What are the registration costs associated with the Programme? 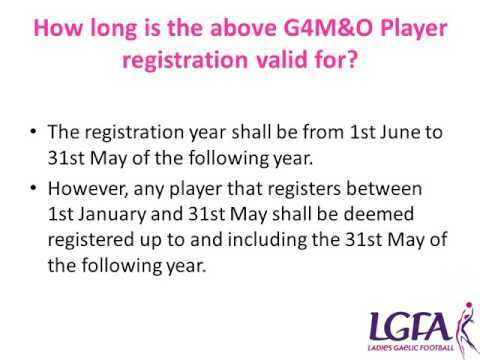 How long is the above G4M&O Player registration valid for? The registration year shall be from 1st June to 31st May of the following year. However, any player that registers between 1st January and 31st May shall be deemed registered up to and including the 31st May of the following year. Does paying the registration fee for G4M&O provide me with full voting rights within my club? No, only full members and full playing members joining the club after 31st June shall be entitled to vote at meetings. If I am registered already as an administrator or coach with my club, do I need to pay the €12 registration fee for G4M&O also? How can I pay my Registration? If your club has a Ladies Football section, then you register as normal paying the appropriate fees through the club registrar. If your club has no ladies football section in the local GAA club then you can contact maire.nimhaoilchiarain@lgfa.ie to get a log in for your club to register through the electronic registration system. The cost to use this system for the year plus full support is €30. This will be €15 after the first year. Please note the club will also have to pay the GAA Public Liability Insurance Levy annually which is €250 and payable when logging in for first time each year on Servasport. Must I renew my registration each year? Yes, registration applies on an annual basis. Do fees apply to Provincial and National Blitzes? Yes an entry fee will apply to Provincial and National Blitzes to assist with costs of running same.